To covet is to desire to possess what rightfully belongs to another. It is not simply admiring what another has, but is the desire to take it. Covetousness is a form of greed. You don’t have to be rich to be greedy. You can be poor and greedy, and you can be poor and envy what others have. We now have an entire political party dedicated to stoking the fires of envy and greed. It is called the Democrat party, and its chief strategy is intent on dividing Americans by stirring up envy towards the rich. 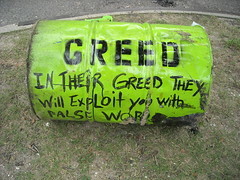 It also appeals to people’s greed, because it promises to take what others have and give it to those who have “less.” This is covetousness, pure and simple, and that means the entire Democrat strategy is built upon a violation of the Ten Commandments: You shall not steal (take what belongs to another) and you shall not covet (desire to take what belongs to another). Anything built upon the evil of sin cannot be good. I am a populist. The fact that there is injustice in the financial system is unquestionable. The problem is: what is the just remedy? Obviously, there is a need for government protection from monopolistic power of corporations, and I think many of our trade agreements are bad for American workers. Any trade agreement ought to start with a level playing field: equivalent wages, equal environmental requirements, etc. * But it will take more than changing a president to fix that mess. Why? Well, consider that the biggest contributors to Barak Obama’s 2008 campaign were companies like Goldman Sachs, a company that orchestrated the bailout and one that controls oil market trading throughout the world. Goldman Sachs wants Cap and Trade for carbon dioxide emissions, and it stands to make billions of dollars on a Cap and Trade market. Cap and Trade will drive up energy costs for millions of the poor in this country. Who stands to make money from such a policy? Not the middle class, but the same banking interests that paid for the president. So while the Democrats appeal to the sense of injustice towards the poor, they are working with huge corporations to put the poor further in debt through taxes. Health insurance companies supported Obamacare because they stand to make a lot of money through forced participation in insurance plans. What I am saying is to follow the money: not words, but deeds. The game is rigged against the middle class by the Democrats as much as it is by the Republicans, except for the fact that the Republicans want to free small businesses from regulation and provide more opportunities for everyone to become rich; and they want to reduce the size of government so that the people and businesses are not destroyed by excessive taxation. President Obama said Mitt Romney’s tax plan amounts to “Robin Hood in reverse” because it would take money from the poor to help the rich. The Democrats say it is an issue of “fairness,” but if you look at the way it is portrayed by the President, it is not fairness he preaches. It is resentment towards the rich, as if by being rich, the rich are somehow automatically guilty of being unjust and unfair. It is the same tactic Hitler used to stoke animosity towards the Jews in Germany. It is picking a group of people and making them out to be evil, the cause of all that is wrong in society, so as to justify hatred and retribution towards them by the majority. It is class warfare. It is turning people against one another on the basis of economics or race or perceived success. Yesterday, it was the Jews, now it is the rich who are evil, backbiting thieves and the scum of the earth. Who are these egoists? Each one of them merely defends the interests of his class. Behind them all stands either the Jew or their own moneybags. They are all nothing but money-grubbers, living on the profits of this war. . The Jew is said to be gifted. His only gift is that of juggling with other people’s property and swindling each and everyone. Suppose I find by chance a picture that I believe to be a Titian. I tell the owner what I think of it, and I offer him a price. In a similar case, the Jew begins by declaring that the picture is valueless, he buys it for a song and sells it at a profit of 5000 per cent. What I am saying is that attacking the rich because they are successful or rich, is like attacking Jews because they are Jews. Rhetoric is easy; solutions are hard. Stirring up animosity by appealing to the emotions is easy, and it is how Hitler manipulated the masses. He stirred up hatred and played upon the feelings of injustice. It is also a very dangerous practice. * And I don’t have a solution except to add tariffs to foreign goods where they use child labor, 80 hour work weeks, and pollute the environment with hazardous chemicals (not talking about CO2). Tariffs in that situation would make American products competitive. Possibly limiting H-1B visas, so that companies in the US would be forced to offer living wages to our trained and skilled labor. Your entire political perspective strikes me as off base and anti-Christian. First, you exaggerate Obama and the Dems perspective on the rich vs. the poor. The Dems simply recognize that we need more revenue for the government to provide the services we demand of it, and the wealthy can afford to contribute a tiny bit more. The middle class and the poor can not. Also, note that Goldman Sachs and the bankers all lined up to support Romney this year, not Obama. Why? Because Obama tried to rein in their excesses and make the private equity folks give up their unfair tax breaks. And as to trade, the Dems are much tougher in negotiating free trade agreements, demanding environmental and labor protections. Republican philosophy is to have free trade with no such requirements. So your positions and your politics are at conflict with each other. The problem I see is that while the heart of helping people is a good one, the practical method to accomplish it is not as easy as government claims: More taxes and more programs. Having worked for the Food Stamp program, witnessing both the widespread fraud and the ever increasing paperwork, which subverted benefits to the bureaucracy and not to the needy, government is the most inefficient method of fulfilling Christian charity, actually working against the desired end: allowing people, if not causing them, to become perpetual victims waiting on a handout, rather than training them to provide for themselves. My wife, in the school system here has children of parents on welfare for several generations. The children’s greatest ambition is to have children by 16 so they too can go on welfare. There is something deeply wrong with a system that perpetuates indolence. St. Paul said, “if anyone will not work, let him not eat.” That is the biblical balance: charity with accountability; not charity that enables indolence. My second objection is a practical one: government has the capacity to make everyone equally poor, but not the power to make everyone equally rich. Using the government for income redistribution is an unbiblical value based upon covetousness, and it breaks one of the Ten Commandments. Government also does not have the wisdom or power to accomplish this task federally. More and more resources are sucked into running the bureaucracy and less to actual services the larger the programs get. There is not enough money you can take out of the productive hands without causing them to become disincentivized and stop producing. Socialism fails because it is contrary to human nature and self interest. We are seeing it fail in Greece and Europe. It failed in the Soviet Union, and China is now turning to free enterprise. Why? Because human beings will become lazy if their work is not rewarded. Finally, watching health care in places like Canada or England should be a cautionary tale for anyone who wants government in control of health care. I watched a friend’s wife die in Canada because it took 3 months to get an appointment to diagnose a cancer, and then she had to wait 6 months for treatment. She died before treatment started. As the government takes over health care, doctors will leave in droves ( I know, my family is medical), resulting in a crisis in the health care system and a complete breakdown of available services for everyone. So yes, we will all be equal and all be fair and all be equally worse off. The rich will still fly to a resort to get treatment, the rest of the country will become third world. Envy is not justice. Government is not our god or our provider. To trust government to be the solution to all our needs it so make it into an idol and a god… a trust in which God will surely break us of because he is a jealous God and wants our trust and our loyalty to be in Him alone. Billy, you said ” First, you exaggerate Obama and the Dems perspective on the rich vs. the poor.” After being assaulted by 100’s of commercials on TV here in the US, you would not say I am exaggerating. The recurrent line is “Romney wants to give tax breaks to millionaires and make the middle class pay more in taxes.” – Approved by Obama. That is nothing but class warfare and a total distortion of what is being proposed. But it is convenient to make millionaires the bad people.